Part 1 Developments in food and nutraceutical separation, extraction and concentration techniques: Supercritical fluid extraction; Pressurized fluid extraction; Physically assisted extractions; Advances in process chromatography; Novel adsorbents and approaches for nutraceutical separation; Effective application of membrane technologies; Electrodialytic phenomena and associated electromembrane technologies; Pervaporation for the recovery of aroma compounds; Membrane-based concentration in the food and beverage industries; Separation of value-added bioproducts by colloidal gas aphrons (CGA) flotation; Membrane bioreactors and the production of food ingredients. Part 2 Separation technologies in the processing of particular foods and nutraceuticals: Dairy and egg processing; Fruit juices; Oilseed processing; Brewing; Purification of dairy nutraceuticals; Concentration and purification of omega-3 fatty acids; Extraction of natural antioxidants from plants; Egg proteins and peptides for nutraceutical applications; Supercritical-fluid extraction of lycopene from tomatoes. Separation, extraction and concentration are essential processes in the preparation of key food ingredients. They play a vital role in the quality optimization of common foods and beverages and there is also increasing interest in their use for the production of high-value compounds, such as bioactive peptides from milk and whey, and the recovery of co-products from food processing wastes. Part one describes the latest advances in separation, extraction and concentration techniques, including supercritical fluid extraction, process chromatography and membrane technologies. It also reviews emerging techniques of particular interest, such as pervaporation and pressurised liquid extraction. Part two then focuses on advances in separation technologies and their applications in various sectors of the food, beverage and nutraceutical industries. Areas covered include dairy and egg processing, oilseed extraction, and brewing. This section discusses the characteristics of different foods and fluids, how food constituents are affected by separation processes and how separation processes can be designed and operated to optimize end product quality. 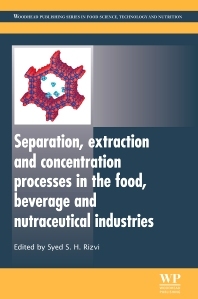 With its team of experienced international contributors, Separation, extraction and concentration processes in the food, beverage and nutraceutical industries is an important reference source for professionals concerned with the development and optimisation of these processes. Syed Rizvi is Professor of Food Process Engineering and International Professor of Food Science at the Institute of Food Science, Cornell University. He is renowned for his research into the physical and engineering properties of biomaterials, experimental and theoretical aspects of supercritical fluid processes, extrusion, and value addition technologies.